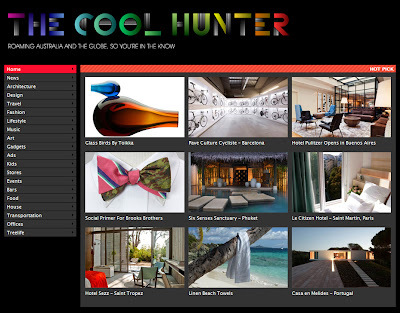 The Cool Hunter, is one of the most-read culture and design sites that celebrates creativity, it is a hub for what's cool, thoughtful, innovative and original, valuing global relevance, not trends. Its aim is to cater for "creative influencers who stay in the know and ahead of the curve. Global in outlook, culturally discerning, The Cool Hunter readers are connected, creatively aware, confident, stylish and sociable. They value architecture, design, style, music, fashion and entertainment. They work, play and travel internationally and bring with them distinguished tastes and a demanding appetite for quality information." Celebrating the beautiful and enduring from architecture, design, gadgets, lifestyle, urban living, fashion, travel and pop culture. The Cool Hunter is not a trend-spotter, trend-watcher or trend predictor, but aims to be ahead of and outside of trends and fads. The Cool Hunter also has a whole category dedicated to 'kids'. A post by Cool Hunter writer Tuija Seipell - Reinventing Kids' Spaces/Playgrounds provides a montage overlaod of beautiful, bright and interesting 'kids' spaces'. 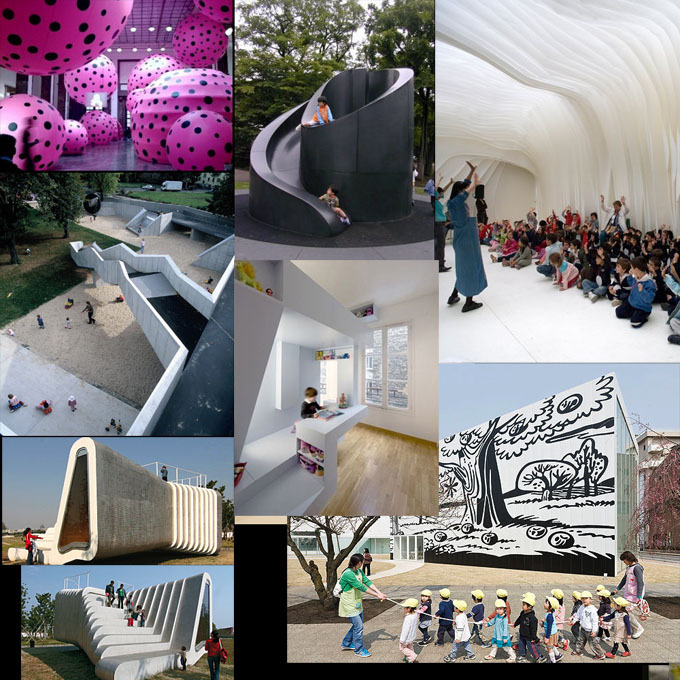 Offering inspiration to design fun and playful spaces for(?) kids. "Kids have boundless imaginations. No matter how poor, colourless and toyless their environment, they’ll find a way to play. They will play with stones, twigs, grass and water, and they will play with each other. They’ll think up ways of turning mundane items into creations that have all the life of the latest computer game." "...what our urban kids have available to them, is excessively abundant. 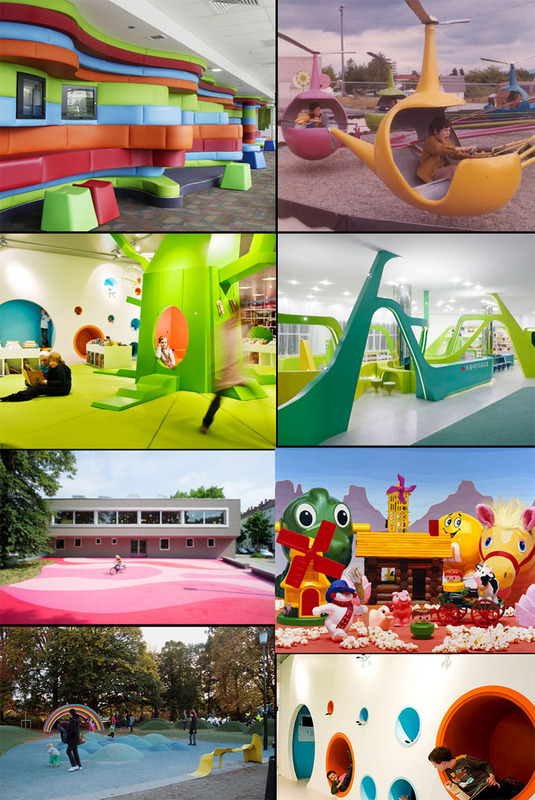 They have daycare and play spaces, parks, playgrounds, even yards. 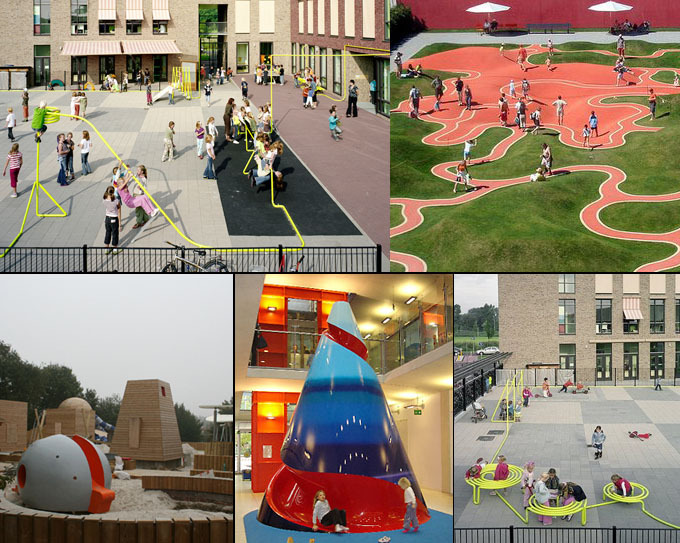 Yet, when we look at the basic play environments in our communities, there’s no denying that they are sadly short of what they could be. With some colour, imagination, labour and resources, they could all be so much better." "We spend millions annually on "adult playgrounds" — stadiums, concert halls, bars, restaurants. We spend billions advertising and promoting them. Why is it that we do not seem to want to dedicate the necessary resources to give our children the best we can offer?" "Every dedicated kids’ arts organization will be able to point you to reams of research reports that show that early access to arts and arts education aids children in all aspects of their lives later on. They will build self-confidence; discover their abilities, skills and talents; and in the best of circumstances, they will grow to be fantastic contributors in their communities. Yet another reason to make sure our kids live and play in environments that are rich in creativity, arts and inspiration." "If this generation of children is going to be responsible for solving the problems of a world where children are still too hungry to play at all, then we should be paying closer attention. We should be giving our kids — regardless of their resources — all the support and inspiration we can." 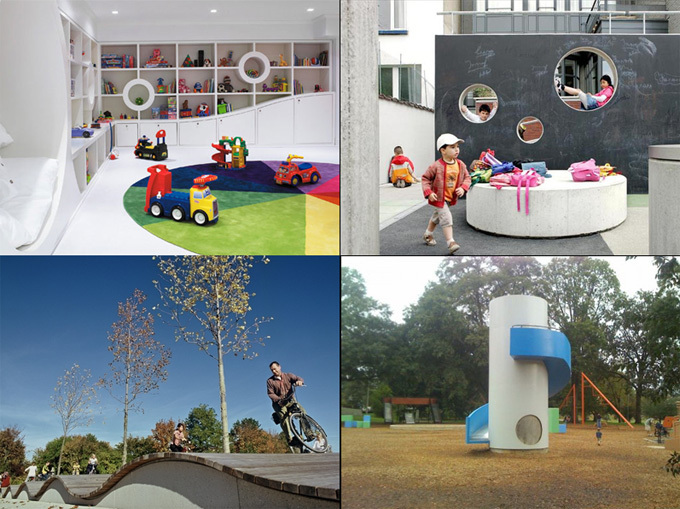 Seipell makes a compelling argument to spend more creative time and energy in improving children's 'play-scapes' and spaces. However, like much displayed on the Cool Hunter website, many of the images are just that - inspiration, and do not delve into deeper issues, theories or research and often do not provide references of the artist, designer etc.